The price of a USPS Forever One Ounce Postage Stamp is now $0.55. Rates manually verified by site administrator on April 8, 2019. The largest-ever increase in the price of a First Class stamp occurred on Sunday, January 27, 2019. The cost of a stamp increased 5 cents so that today the current price of a Forever Stamp is now $0.55. Scroll down the page for historical rates. Sign up for a no-cost 4-week trial of Stamps.com. Print your own postage, enjoy discounted First Class ($0.03 savings) as well as Priority Mail rates (up to 39% discounts). You can cancel your account anytime, and ongoing accounts are $17.99 per month. There is a lot more info on this page if you keep scrolling! What is a Forever Stamp? How much to mail a Postcard? Should you stockpile Forever Stamps? Historically the Post Office has been limited to raising the cost for stamps according to the official inflation rates. At the end of 2018 the Post Office received regulatory approval to raise the price of postage “inflation + 2%”. Well, that didn’t last long! The current official rate of inflation for 2018 is 2.3%, and an increase of 2.3% + 2% would have instead increased the the price of a stamp to only $0.52, not $0.55. While I could well be wrong, I anticipate the next First Class Postage Rate increase will be late January 2020 and will be “inflation + 2%”. Such an increase would be 4-5%, and would translate to a $0.02 or $0.03 price increase. The obvious idea is to make a phone call, send a TXT or email instead of sending a letter. Granted, this technically isn’t saving money while sending a letter (it’s avoiding sending a letter), but it’s still a way to save on your postage. Yet, on the other hand, there are times when we need to mail a letter or it simply represents a good value (when was the last time you mailed someone a little note of appreciation?). Buy stamps before price increases. Use Stamps.com to print your own postage at discounted rates ($0.03 savings for First Class, and up to 39% on Priority mail). If you are interested in a trial (can be cancelled at anytime), help support this site by signing up for your own Stamps.com 4-week trial. The time to buy stamps is BEFORE an increase, not afterwards (which is when the media discusses the increase). I send an email about 1-2 weeks before any postage rate increase, so you will likely only receive one email per year. I do not spam, and every message includes an easy unsubscribe link. There’s a reason why first class mail volume is down. It’s much more affordable to send email. When possible, instead of buying stamps, I recommend you try sending an email newsletter using the same service I use. Visit the United States Post Office web site for additional rules, regulations, and mailing options. 2 oz. $0.70 A single "Two Ounce Forever Stamp". OR one regular Forever stamp + one Additional Ounce Forever Stamp. OR one regular Forever Stamp + $0.15. 3 oz. $0.85 A single "Three Ounce Forever Stamp". OR one regular Forever stamp + two Additional Ounce Forever Stamps. *Note: must be rectangular, cannot be square, rigid, or an odd shape. 1 oz. $1.00 One regular Forever Stamp + three Additional Once Forever Stamps. OR Two regular Forever Stamps (overpays $0.10). 2 oz. $1.15 One regular Forever Stamp + four Additional Once Forever Stamps. OR Two regular Forever Stamps + $0.05 postage. 3 oz. $1.30 One regular Forever Stamp + five Additional Once Forever Stamps. OR One Global Forever Stamp + one Additional Ounce Forever Stamp. 4 oz. $1.45 One regular Forever Stamp + six Additional Once Forever Stamps. OR One Global Forever Stamp + two Additional Ounce Forever Stamp. OR Three regular Forever Stamps (overpays $0.20). **Note: must be rectangular or square, and must not be rigid or contain items that cause more than 1/4″ variation in thickness. How much do additional ounces cost when mailing a letter? In 2019 the cost for each additional ounce of postage is 15 cents ($0.15). The USPS offers an “Additional Ounce” type of Forever Stamp. Forever Stamps are a special type of stamp created by the United States Post Office that will always be worth one First Class stamp. When they were initially created in 2007 a Forever Stamp cost only $0.41. Their value has increased since then and they are now worth significantly more. Remember how you used to have buy $0.01 or $0.02 stamps to cover postage cost increases? That is a thing of the past with Forever Stamps! The cost of a first class stamp varies, with the price being adjusted (typically once every year or so) by the Post Office. The current rate is $0.55 (careful, Google often displays outdated info, my site is always-up-to-date and has a manually verified rate). By purchasing a “Forever Stamp”, the stamp’s value will adjust to match whatever the then-current postage rate is for a one ounce stamp. Does the Post Office Have an Online Postage Calculator? Yes, they do. It’s available here: USPS Postage Price Calculator. Around May of 2017 the calculator was updated to try and make it easier to use, but, WOW, for calculating postage for letters/envelopes it became MUCH more difficult to use. For example, every person using the calculator sees two checkbox option about shipping live animals or day-old poultry. I wonder how many people that message applies to? But, yes, what do you expect: it’s a government-created web site 🙂 All kidding aside, other than being a bit complex, once you’ve been through it a few times it works quite well for Priority mail and packages. If you are looking up the price for a letter, on the first screen, make sure you select the icon titlted “Calculate price based on Shape and Size”. In 2019 the cost to mail a standard size postcard is 35 cents ($0.35). The postcard can be no larger than 6 inches by 4.25 inches. The United States Postal Service offers “Postcard Forever Stamps”. Forever Stamps never expire and will always be the equivalent value of whatever the corresponding postal rate is – for example, a one-ounce First Class stamp for a regular Forever Stamp (that’s why I created this site: to keep track of the current postage rate which regular changes). The Post Office offers a variety of Forever Stamps: Regular (one ounce), Additional Ounce Forever Stamp, Two Ounce Forever Stamp, Three Ounce Forever Stamp, Non-Machinable Surcharge Forever Stamp (would be used for odd sized letters), Postcard Forever Stamp, and the Global Forever Stamp. Was the United States the first to issue Forever Stamps? Forever Stamps are a type of “non-denominated postage”. While I do not know for sure which country was first, I do know that the United Kingdom began issuing non-denominated postage stamps back in 1989. The United States Postal Service launched “Forever Stamps” in 2007. In addition, the USPS had been issuing generic stamps close to rate changes that could be used before and after the rate change starting back in the 1970’s. The practice continued in more recent years with stamps that began with a letter: A, B, or C, and continued up through the letter H.
How are postage price increases handled? Prior to 2017, the Post Office was only allowed to increase the price of stamps according to official inflation rates – unless special approval was requested and provided. At the end of 2017 the Post Office received regulatory approval to for increases that would be “inflation + 2%”. The January 2018 increase was already planned at “inflation”, and was left as such. The 2019 first class postage increase was the largest ever at 10%! As to specifics, the Postal Service first receives approval from theri internal “Governors of the Postal Service” and then must receive approval from the Postal Regulatory Commission. Where is the best place to buy postage? You have quite a few options for puchasing postage online. The obvious option is to buy stamps directly from the Post Office. They do charge $1 for shipping/handling your order. Another option (which helps support this site) is to sign up for a free trial account at Stamps.com. This allows you to print your own postage (at discounted rates). Trial accounts can be cancelled anytime; ongoing accounts cost $17.99/month. You can also buy stamps from Amazon.com (which helps support this site). The Post Office is actually one of the stamp sellers at Amazon.com. If you buy stamps at Amazon.com you will likely pay a little bit more than if you bought them directly from the post office, but if you are a member of Amazon Prime (free trial available), you won’t have to pay the $1 shipping and handling fee that the Post Office charges if you order directly from the USPS. Be careful buying stamps from other sources (especially eBay). You might end up with counterfeit stamps. Helpful? the best way to support this site is sign up for a free Stamps.com trial account. The trial can be cancelled anytime and you can print postage at discounted rates. How does clicking an Amazon link help this site? By clicking any Amazon link above (a new window will open), any product you order from Amazon within 24 hours (doesn't matter what the product is) will generate a small referral credit back to my site. You may not think simply clicking a link helps, but it does. Thank you for your support. Should You Stockpile Stamps, Perhaps as a Hedge Against Inflation? Because the value of a Forever Stamp increases with the rate of inflation (and might even at a higher rate than inflation in the future), the question arises: should you buy more stamps than you will be using to mail letters as an asset diversification strategy and hedge against inflation? If a future increase is going to be significant, there will be time to purchase any stamps that you’ll need (even a multi-year supply) before the rates increase. Signing up for my notification list is one way to be notified. Anytime you are looking to invest into a particular asset, you want to keep in mind the principles of supply and demand. The greater the demand and the lower the supply – the more your asset will increase in value. First Class Mail Volume has been steadily decreasing for years. Think about how many bills you used to pay via mail that are now electronically paid, and how many letters you used to mail to stay in touch with friends or relatives? First Class mail volume has steadily decreased over the past twenty years and will likely continue to do so. Some who are investing in stamps as a currency hedge are doing so in the event that extreme economic challenges may occur in our society, or that societal disruption or upheaval will some day occur. While no one wants that to occur, there is always the possibility that those events may occur. 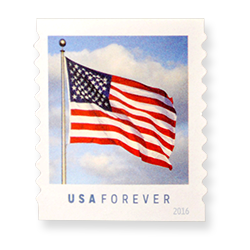 If the Postal Service and the US Government cease to exist as we know them, I believe the value of Forever Stamps will significantly decrease, perhaps to the point of being worthless. While, yes, delivery services of some sort will always exist, who is to say that they will accept a USPS Forever Stamp as a form of payment. If you are investing in Forever Stamps and are concerned that society, as we know it, may cease to exist, keep in mind that the value of Forever Stamps is primarily contingent on the Postal Service continuing to function. I recommend you buy one year’s worth of stamps before any regular stamp price increase. If a significant stamp price increase is announced my recommendation will be to consider buying multiple years’ worth of stamps at that time/before that increase. You’re welcome to stockpile stamps now, and it may well even prove to be a great inflation “hedge” — just make sure you consider all of the various related factors.